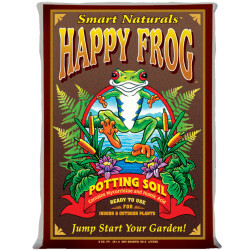 We carry the finest potting soils and other items for all your potting and planting needs. To keep your plants as beautiful and healthy as the day they arrive, you’ll need a few essential upkeep items. Take a look at our selection of fertilizer, moss, pesticides and foliage cleaners. 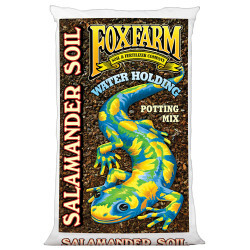 The ultimate potting soil-everything your plants need, in one bag. Ocean Forest is a powerhouse blend of premium earthworm castings, bat guano, and sea-going fish and crab meal. Aged forest products, sandy loam, and sphagnum peat moss give Ocean Forest® its light, aerated texture. Start with Ocean Forest® and watch your plants come alive! Your potted plants deserve the best. Their roots can't seek out nutrients in the ground, so you have to bring it to them. That’s why Happy Frog® Potting Soil is alive with beneficial microbes and fungi that help break down organic matter and feed the plant roots. Between the earthworm castings, the bat guano, and the aged forest products, your container plants have never felt so good. 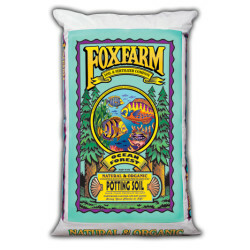 And don’t worry—FoxFarm uses only the highest quality, premium ingredients—no cheap fillers, no topsoil, no sludge. Plants that are grown in hot climates need that extra thirst quench so that they can stay vigorous and not get stressed from drying out. The inconvenience of frequent waterings is sometimes problematic for growers who just can’t get to their plants in time. Moisture has to be accurate; too much will cause root rot and plants will suffer. TRIPLE-WASHED Low Salt Content As you trek through a tropical jungle, your steps remain light and buoyant, never soggy. The rainforest floor is remarkably deep with layers of exotic coconut palm humus. It is cool and damp for several inches. Hold the richness in your hands, feel the soft silky texture. It’s the perfect medium for cultivating plants. The coir in Coco Loco behaves like little sponges making water available as needed by the plants. Coco Loco Potting Mix has the ability to hold more than its weight in water—while still draining well. Lower humidity reduces the possibility of attracting mold and root rot, as well as leaving insects less likely to bother your potted plants. 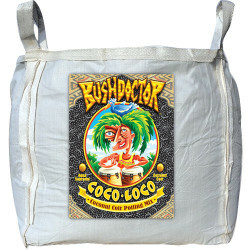 Plants growing in Coco Loco will not require water as often as your usual potting mix. Whether you’re growing in hanging baskets, vertical gardens, containers, or seedling trays, extend your watering schedule. In most climates, every two to three days will be enough. Always adjust your watering schedule as needed. Triple washed for a low salt content. 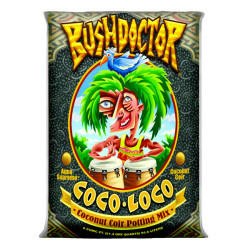 Bush Doctor Coco Loco Potting Soil by Foxfarm is one crazy little mix that’s chock-full of the best coconut coir available. Also includes plenty of good stuff like aged forest products, perlite, earthworm castings, bat guano, Norwegian kelp meal, oyster shell and dolomite lime. Heck, it even has some mycorrhizal fungi tossed in for good measure!